Guy de Maupassant whose real name was Henri René Albert Guy de Maupassant was known as the greatest French short story writer. He was born in the Château de Miromesnil, Dieppe on August 5 1850 and died forty years later on the sixth of July. He studied law in Paris but he decided to volunteer in the army during the Franco-Prussian War at the age of twenty. Then, started his career as a civil servant in 1872 to 1880. He already showed his interest in literature since he was in junior high school. Then, recognizing himself a poet, he started writing. His first debut was Des Vers (1880) and in the same year, Soirées de Medan and Boule de Suif were published. Des Vers became popular at that time and it opened the gate for Maupassant to enter literature world. Guy de Maupassant‘s skill of writing was undeniable. His literature works were marked by objectivity and highly controlled style. He, sometimes, also put sheer comedy into the story he wrote. One of his style which was easily recognized was the way he took simple everyday life and revealed the hidden sides of it. Almost all of his novels and short stories had an exploding unexpected ending. He always gave us a certain feeling and prejudice then changed it at the end of his story. 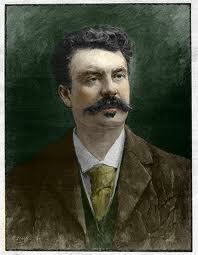 Maupassant authored 300 short stories, six novels, three travel books, and one volume of verse. Among Maupassant's best-known books are Une Vie (A Woman's Life, 1883) and Bel-Ami (1885). One of his masterpiece was a short story titled Bellflower. In this story, he proved his skill in creating a pattern of some certain plot. There are three stages of plot found in Bellflower; present, past, and the past of the past. Bellflower took place in a village which Maupassant described as a large village but not too large to be called a town. This village was a few hundred off and nestled round a black bridge church. As what has been mentioned in the previous paragraph, there were three stages of plot in this story. This was what made it a bit complicated. The first stage was when the mature writer described his feeling of being haunted by his own memory. The second stage was when the writer retold his childhood memory about Mother Bellflower. Then, the third stage was the when the writer retold the story he heard from the medical man about the chronology of how Bellflower lost her leg when she was young. Mostly, the setting of the story was in the writer’s house. Hearing the word house probably gives us the tone of warmness and affection. When we are in our own house, we would get the happy feeling of gathering with our family and friends. This was probably what Maupassant tried to give which was the atmosphere of kinship. In the story, the closeness of Mother Bellflower and the writer was stated clearly. The writer also considered the lady as his second mother. This was the value of kinship. Then, another tone was rigidity which Mother Bellflower showed throughout her attitude. Sadness, astounding, and shocking tone appeared when the writer found the lady dead in the linen room. It gives us the atmosphere of sorrow. Beside the writer’s house, Bellflower also took place in a school building where the young Bellflower worked. She worked as a sewing teacher which signified that she was an educated girl. In this building, she had a drama with her first love, Sigisbert, who caused her limped. There was romantic tone when she and Sigisbert met up in the hayloft. This tone gave us the atmosphere of happiness and passionate. But then, the romantic tone turned into tragic and scary tone after Bellflower jumped out the window. There are many conflicts in this story. The main conflict was between the writer and his memory. In his memory, there are conflicts between the writer and Mother Bellflower, the writer and the condition occurred at that time, and Mother Bellflower and her past. These conflicts reached its rising conflict when the writer retold the day he found the lady laid dead in the linen room. It was such a shocking moment for him. Then, the climax was when the writer retold what he heard from the medical man. He heard him tell about the chronology of how Mother Bellflower lost her leg when she was young. It was because the young lady wanted to save his first love’s carrier. This story the medical man retold made the writer more shocked than before. He was just a child that he should not have heard this kind of thing. The resolution of these conflicts was not obvious, actually. However, ordering from when the climax occurred, the resolution was when the writer was remained alone in the drawing room. He tried to calm down his childish heart, then, he heard the noise of the people who were carrying Mother Bellflower’s body. The characters in this story are the writer, Mother Bellflower, the medical man, the writer’s parents, Sigisbert, and Old Grabu. The writer took a role as the main character and as the narrator who drove the course of the story. All of the interactions in this story occurred when the writer was just a child. There are neither direct interactions between the writer and Sigisbert nor the writer and Old Grabu. It was because Sigisbert and Old Grabu were in the medical man’s story. The writer only retold them without knowing them in the real life. We can tell that the writer was known as one of Mother Bellflower’s closest people. He was just an ordinary child always looking for attentions from someone who could make him comfortable; and Mother Bellflower was that someone. He usually came to the linen room to see Mother Bellflower and to hear stories. He thought his mother had none of the flavor and the fullness of the vigor of the peasant woman's narratives. It was perhaps because he had already found someone who could tell him stories in an enormous way, so he compared his mother with her, then, decided that his mother was no better. From these, it was seen clearly that the writer’s characterization was just like the other children at his age who had mood and feeling fluctuation inside him. The conversation said by Julie Romain above was an emphasizing of her love and faith in the love of the two men who once entered her life. She did not want any other love, no matter if it was bigger than the two man had, because they two had intoxicated her with tones and words. Back to the Bellflower short story, it was clearly represented that its theme was the life of Mother Bellflower. At first, the writer told us about his closeness with Mother Bellflower and described her, but then at the end he told us about the hidden side of Mother Bellflower which was literally the opposite of her visible side. For some people, this short story was not suitable to be read by children because its content is for adults. There are tragic parts which were described very clearly to its details. Maupassant also put too many impossible probabilities in this story. For example was the beard Mother Bellflower had. There was no way for a woman to have beard. Maupassant should have gone with logic to meddle in the reader’s way of thinking. However, it is the reader’s right to judge whether it was Maupassant’s inadequacy or just his unique style of writing.